The Director of Brand Communication reports directly to the VP Marketing and Communication. 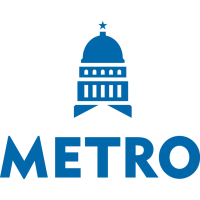 This position is responsible for creating cohesive external messaging and creative content that elevates the Capital Metro brand in the Central Texas region. This position is responsible for the planning, activation, and tracking of integrated communication plans used to guide messages in all external channels, including news media relations, social media, advertising campaign creative, and executive presentations. Provide counsel to the President and CEO and executive staff on operational and policy matters. Supervise the communication and creative content teams. Manage the communication and creative content budgets. • Bachelor’s degree in Marketing, Communications, Public Relations, or related field. Related experience may substitute for educational requirements on a year for year basis for up to four (4) years. • Seven (7) years of progressively responsible experience in public relations, marketing or brand development including three (3) years of supervisory/lead experience. • Proficiency in Windows and Mac environments. Proficiency in publishing content on the leading social media platforms, including Facebook, Twitter, Instagram and YouTube. Understanding of Adobe Creative Suite. • Experience building rapport, establishing credibility to engage and influence stakeholder and constituents at all levels, internally and externally; astute, seasoned leader, business partner, and stakeholder relationship manager. Experience presenting to all levels of an organization.